Homer is the new face of the Highland County Chamber of Commerce Buy Local Campaign. Taking a slightly different path from its annual dinner, the Highland County Chamber of Commerce will celebrate its 25th anniversary on June 25 with an event dubbed Party on the Lawn. The celebration will take place on the historic Scott House lawn in Hillsboro starting with a social hour from 5:30 to 6 p.m., then dinner and a brief presentation or two. The Party on the Lawn will take the place of the chamber’s annual dinner, but it will be similar. Tickets for the event are $35 each, which includes a meal catered by Ponderosa, All Seasons Catering, Cow-A-Burger, Batter Up Bakery and Farm House Catering. Elmore said the chamber, which currently has approximately 330 members, was created 25 years ago when chambers of commerce in Hillsboro and Greenfield decided to merge. She said the chamber’s goal is to be the voice of Highland County in a wide range of arenas. Incorporated into the Party on the Lawn, Elmore said, will be the chamber’s new Buy Local Campaign. 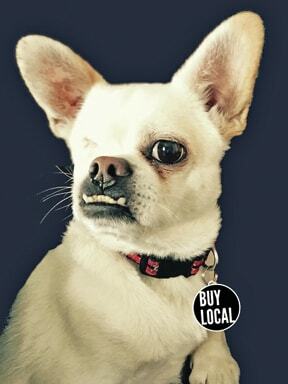 The campaign has a new face featuring Homer, a one-eyed dog that local veterinary assistant Amy Sharp brought home from a dog rescue event. Another new feature of the campaign is Behind the Business, a promotion that features stories on various chamber members each month on the chamber’s website, social media sites and in the chamber newsletter. The first business that’s currently being featured is Bon Appetit Gourmet Shoppe & Gifts in Hillsboro. Chamber assistant Stormi Bledsoe said she plans to feature one business a month at least through the new year. The Party on the Lawn offers chances for local businesses to promote themselves. A platinum sponsorship for $1,000 includes eight tickets and table, a gold sponsorship for $500 receives six tickets, a silver sponsorship receives four tickets and a bronze sponsorship receives two tickets. Elmore said the sponsorships help make the dinner possible. The Party on the Lawn will include food, drink, music and camaraderie, according to a news release. For more information visit www.TheHighlandChamber.com or call 937-393-1111.